Just part of the pizza delivery revolution happening on the High Road! 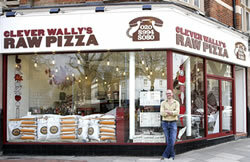 Clever Wally’s Raw Pizza is located at 85 Chiswick High Road, London W4 2EF. Open from 4pm to 10pm on weekdays, 1pm to 10pm Sat and Sun. Free delivery if you call 0208 994 8080. Menu is online at cleverwallys.com. Customer feedback has been crucial in the development of the new Clever Wally’s Raw Pizza Summer menu, featuring three new fresh, delicious handmade raw pizzas, a build-your-own raw pizza section and three attractive Deals on Wheels offers. “We’ve been listening carefully to your suggestions for the last few months and I’m pleased to say we’ve worked a lot of your thoughts into the new menu,” said Clever Wally’s founder, Gregor Sokalski. “The front and back page document a host of dreamy raw pizza encounters, Wally’s horoscope and a genuine “Pimp Your Pizza” competition where you submit your best pizza recipe to Wally’s pizza tasting jury at feedback@cleverwallys.com for The Ultimate Judgement. The best recipe out there will make the cut for our Fall menu, along with overwhelming praise to the master chef. Menu-wise, there have been countless requests for a seafood raw pizza, so we’ve now got a refreshing poached salmon option with baby spinach, fresh coriander and a slice of lemon to drizzle over your pizza once baked. Also new is a proper vegetarian pizza with asparagus, artichoke hearts, chestnut mushrooms, red onion, cherry tomatoes and a dash of fresh parsley. Finally, a full-on meat fiesta and 7” D.I.Y. raw pizza kits for the kids. Our extras section is now front and centre so you can easily build your own raw pizza from our list of store-prepped ingredients and fresh herbs.